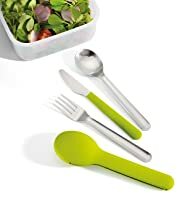 This high quality GoEat cutlery set by Joseph Joseph contains a full-size knife, spoon and fork. 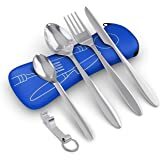 Made from 18/0 stainless steel, the set is as durable as tableware you would use at home, with the additional benefit that it nests tightly together in a compact silicone case. By Joseph Joseph, masters of form and function. 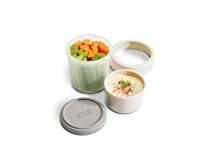 GoEat is a range of products that are designed to make it easy and convenient to eat homemade food on the go. There’s no need to carry around multiple food containers with GoEat all the elements of your lunch are kept safe and separate. When finished, each item then compacts down to save space in your bag for the journey home. 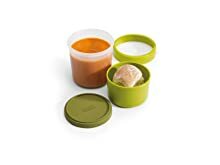 The range comprises a variety of containers that are ideal for sandwiches, salads, soups or snacks, plus a compact stainless-steel cutlery set. Ideal for yoghurt and granola or vegetables and dips. 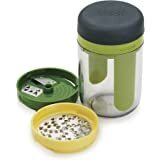 Ideal for salads, rice and pasta dishes with separate salad-dressing pot. Ideal for soup and bread or croutons. 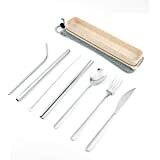 High quality 18/0 stainless-steel knife, fork and spoon which snap magnetically together to fit neatly in its protective silicone case. 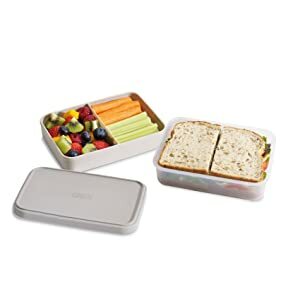 This space-saving lunch box is a clever alternative to the usual collection of plastic containers and bags that are required to transport your sandwiches and snacks to work or school. 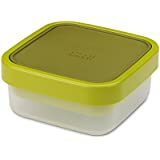 It boasts a large base compartment for sandwiches and dry food, a top compartment with a divider for wet food or snacks and a silicone lid with a locking collar to keep it all fresh and safely held inside. When empty the top compartment fits inside the base and it all locks together again for easy transport home. I like this silverware set very much. After years of purchasing plastic silverware (and winding up with 300 extra plastic knives that I never use), I decided to limit my waste and get something I can just wash and reuse. I like that these are magnetic and fit together nicely. I find it a little annoying to put them back in the silicon case as it is very tight and feels like it might rip (it has not ripped yet so maybe I'm just overthinking it). I might stop using the case altogether since they stay together with the magnet anyway. It is nice to have the option of protecting them from touching other things in your lunch bag though. The silverware is nice quality and easy to use. One small complaint is that the spoon is very round and so does not fit into the corners of yogurt containers very easily, particularly the "flip" cups made by Fage and Chobani. I wish it had a more slender profile for that reason, but in general it is a nice spoon good for eating soup. The fork is very flat and blunt which is not my preference but for a general utility fork it is fine. The knife has a nice silicon casing on the handle and cuts well for your usual lunchtime needs. 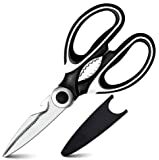 I have not tried to cut anything really tough with it. They clean easily and are convenient to use. Overall I'm pleased with my purchase. Credit to summerkitten’s review for the tip! The case is silicone which is a magnet for dust, lint, hair, you-name-it. To stop the attraction, wipe it, and the silicone knife handle, down with white vinegar or anti-static wipes or a bit of fabric softener. This is a brilliant product! 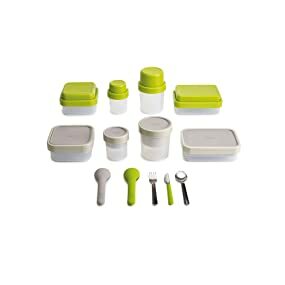 Purchased for a PreK toddler’s Omiebox, the utensils all measure just under 6.5 inches, the case probably 6.5 exactly. I searched long and hard for a perfect-sized, quality, hard-to-lose and affordable utensil set for a 4y/o. Most spoons are too shallow, fork tines are too dull, sets have no case, or the case is too bulky or fragile, or a pain to use and clean, or one piece or the entire set is simply lost in a myriad of other kids’ utensils at school and never seen again. When I saw this I thought it was genius! 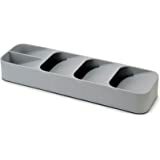 Magnetic utensils with a small, striking case that pick up food properly and aren’t overwhelming for a child or any adult on-the-go was a perfect solution. And it’s super cheap, I saw the same prices and higher for mediocre options. I’m praying this doesn’t get lost immediately, either way I’m buying a few more for myself, backup and gifts for others. 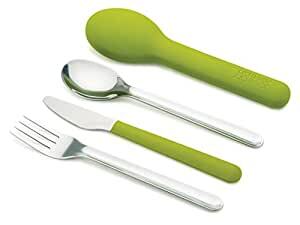 What a nice set of reusable utensils! I don't know how I lived without this. 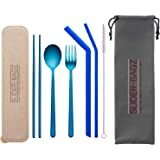 You get a sturdy fork, spoon, and knife that magnetically stick together and fit into a silicone case. 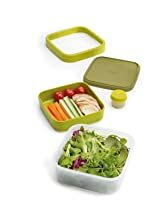 The silicone case is open on one side which allows air to circulate in case your silverware is still wet after cleaning it. The quality is very good. The instructions say that the utensils are dishwasher safe but that hand washing is recommended. I hand wash which works just fine. This set of utensils is much better than a spork or spork-knife, items I have also tried. And the whole package is still very compact so I just always have it with me and never have to worry about having utensils. Great for everyday use, but also if you are traveling. I usually wash with whatever soap is present, but if you specifically wanted dish soap, I recommend repurposing a tiny hand sanitizer or travel shampoo bottle and filling it with dish soap (and keeping that in a Ziploc just in case the cap is open). A+ product if you're environmentally conscious or just like the convenience of always having utensils. 5.0 out of 5 starsStop losing your good silverware! I carry my lunch every day and the lunch tote seems to get heavier and heavier ... and I leave my good spoons and forks everywhere. This set is PERFECT for carrying in a lunch bag or purse. Or even stashing in the glove box of the car. It's compact, yet big enough not to feel that way. And despite other reviews, it's easy to slip in and out of the case. I bought two sets and love them. I got this in green (my favorite color!) and the container has a slit opening on one side, not a clasp and hinge opening like I'd expected. Other than that, though, I love this! The magnetic knife really helps keep everything together, and so long as you're not roughly shoving the utensils into the container, there's little chance of ripping. They are easy to clean; I just make sure to dry each piece before putting them all back into the case to reduce any chance of grossness. I did notice that the container picked up lint the first time I put it in my bag, but if you care enough to wipe the container's outside down with vinegar, then it'll stop picking up link. The utensils themselves are a little on the small side of standard - they're perfect for me, but I could see how a taller person might find these small. I'd say each utensil is 5.75 inches give or take. I keep these at my desk so I never get back with lunch but without the utensils to eat it!